The OIE Veterinary Education Twinning Programme between the Royal Veterinary College (RVC) and the Jordan University of Science and Technology (JUST) began in January 2015 with funding for an initial period of 3 years. It is one of the first education twinning programmes endorsed by the World Organisation for Animal Health (OIE). The aim of the program is to establish a knowledge exchange platform to share best educational and research practice in the broad field of Veterinary Public Health and to use this platform to facilitate the long term engagement of RVC and JUST in Veterinary Public Health training and research in the Middle East and the Arab region. To achieve this overall aim we will pursue a number of specific objectives in relation to three focus areas: undergraduate education, postgraduate education and continuous professional development. RVC ranked top UK and European vet school and third in the world! The Royal Veterinary College, University of London (RVC) has been ranked as one of the top three veterinary schools in the world by the prestigious QS World University Rankings. 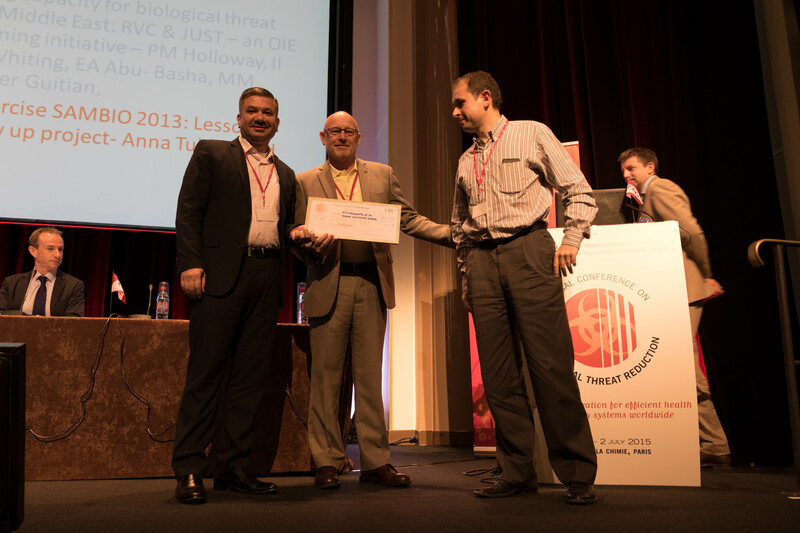 The winners received their awards during the 3-day OIE Global Conference on Biological Threat Reduction. The OIE is delighted to present you their posters. 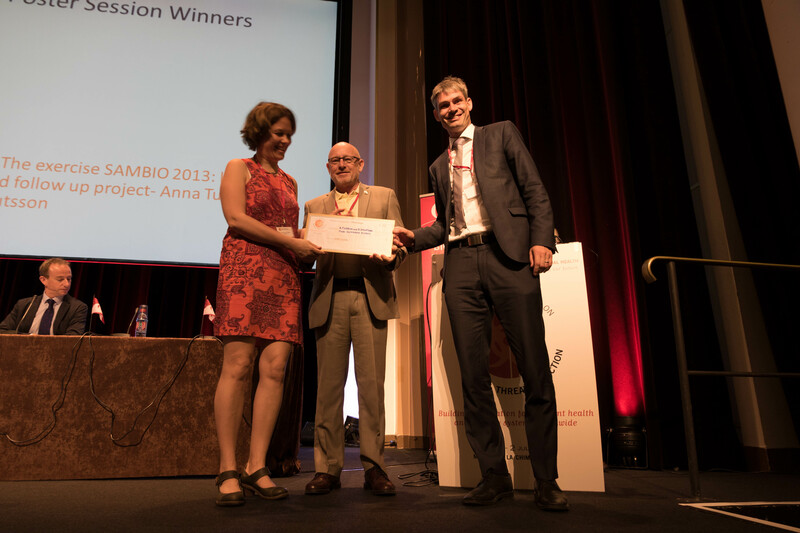 Paris, 17 July 2015 – Launched in the framework of the OIE Global Conference on Biological Threat Reduction (celebrated in Paris from 30 June to 2 July), the posters competition was aimed to present results-based activities, from different countries and regions, which seek or have been shown to reduce biological threats from animal pathogens (including zoonoses). In addition to the 63 speakers of the Conference, more than 30 participants, including experts, policy makers and researchers, had the opportunity to display their work during the conference, specially works linked to the activities that show new national regulatory approaches and capacity building (technical, legislative or governance-focused), research, simulation exercises, networking, novel trainings, policy development, public-private partnerships, and inter-sectoral cooperation (particularly between animal health, public health and security sectors). The competition was highly welcomed by the participants in the conference and the quality of the content of the posters received was outstanding, and with three prizes, the judges were spoilt for choice. 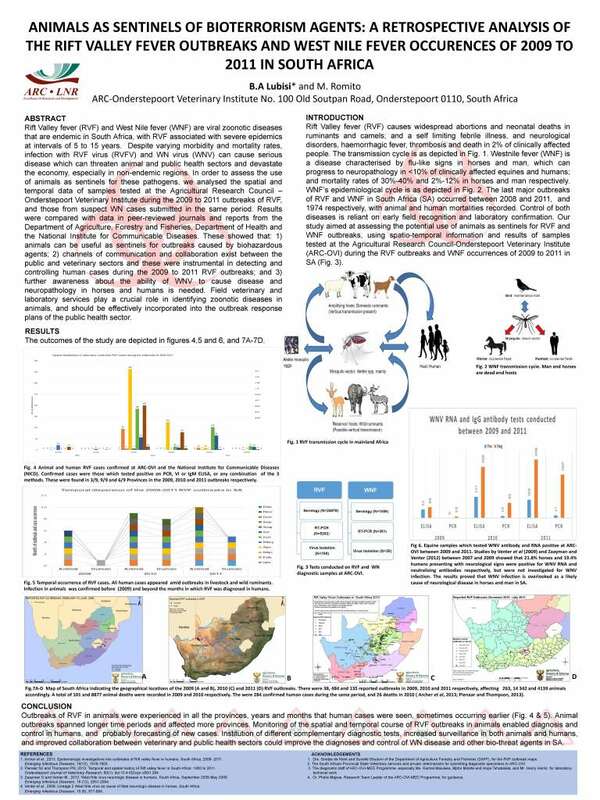 The goal of the poster awarded with the 1st prize, “Animals as Sentinels for Agents of Bioterrorism: A Retrospective Analysis of the West Nile Virus and Rift Valley Fever Outbreaks of 2009 to 2011 in South Africa” (by B.A. Lubisi and M. Romito), is to train animal health investigators and law enforcement to work as a cohesive team, from the start, to determine the outbreak origin and mitigate the spread of the zoonotic, emerging, and/or foreign animal disease before it spills over into the human population. 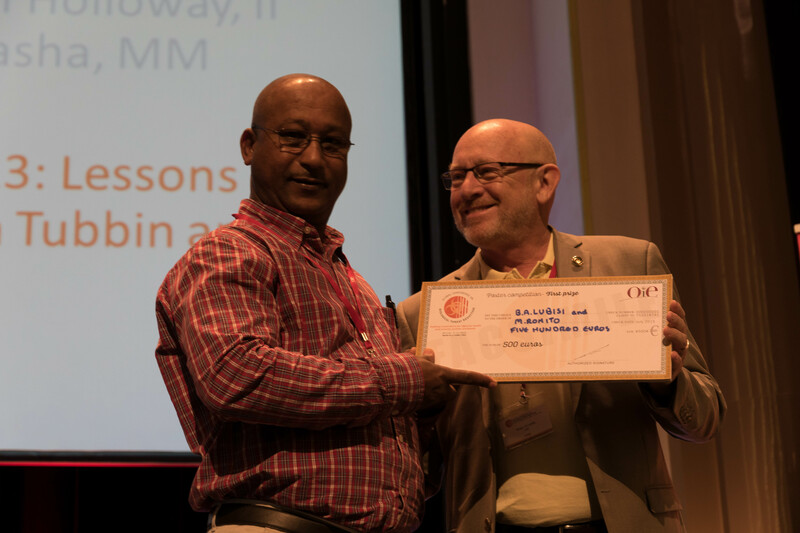 The 2nd prize, “Building capacity for biological threat reduction in the Middle East: RVC & JUST – an OIE educational twinning initiative” (by P.M. Holloway, I.I. Mussallam, M.C. Whiting, E.A. Abu-Basha, M.M. Ababneh, and J. Guitian) explains the current OIE twinning initiative between the Royal Veterinary College, London (RVC) and Jordan University of Science and Technology, Irbid (JUST) by representing one of the very first examples of such a relationship, and seeks to establish the provision of state-of-the-art veterinary public health training in the Middle East and Arab World. 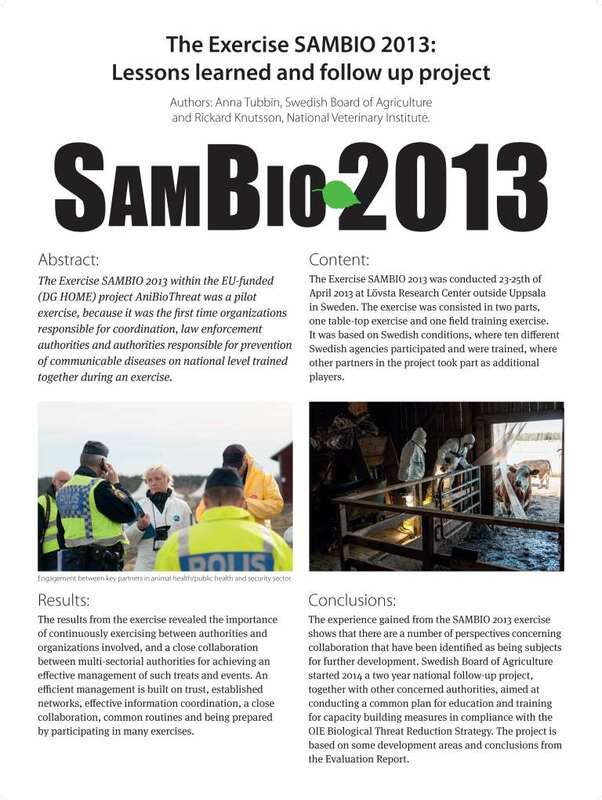 “The Exercise SAMBIO 2013: Lessons learned and follow up project” (by A. Tubbin and R. Knutsson), awarded with the 3rd prize, shows how this pilot exercise was the first time organisations responsible for coordination, law enforcement authorities, and authorities responsible for prevention of communicable diseases on a national level trained together during an exercise.